We strongly believe the standard "S-7" tooth is the most cost effective (less than $1/hr) and flexible solution for mulching brush and trees. Due to customer demand, we have developed two new carbide bit options to suit the needs of a wider array of applications and customer needs. 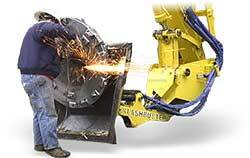 No need to sharpen, reducing field maintenance and eliminating the need for a generator to power an angle grinder. Wildfire Safe, can be used in areas where grinding is banned. Insert and Remove using the same method as our standard S-7 tooth: requiring only safety glasses, hammer and a flat end punch. Change as needed. No need to remove the bit holder from the mulching disk for this operation. Left: Standard "S-7" tooth, designed for daily sharpening. Middle: NEW "S-7" tooth with highly durable fixed carbide bit. Right: NEW "S-7" Carbide bit holder with replaceable carbide bit. Please feel free to contact us on how these design variations can be arranged to best suit your brush cutter and application. Note: feel free to mix and match our " S-7" tooth options as desired for your job but to avoid imbalance issues it is essential each type tooth be mounted in pockets on opposing sides. If vibration occurs for any reason, halt operation and investigate the potential cause. When root cause is found, correct the issue before proceeding with operation. Among other things, excessive vibration will reduce bearing lifespan significantly.